Omar Infante hit .318 with 10 homers and 51 RBIs in 118 games for Detroit last season. KANSAS CITY, Mo. — The Royals continued to bolster their offense after agreeing to terms with free-agent second baseman Omar Infante. Royals officials have not confirmed the agreement, but a source close to the situation told FOXSportsKansasCity.com that Infante will arrive in Kansas City early next week and take a physical. Infante then likely will be introduced as the Royals’ new second basemen shortly thereafter. ESPN’s Buster Olney first reported the agreement Friday and indicated the contract was for four years and worth $30 million. The Royals appear likely to have beat out the Yankees for Infante’s services. The Yankees, having lost Robinson Cano to the Mariners, are desperate for a second baseman and reportedly offered Infante a three-year, $24 million deal. The Royals earlier had lost out to the Yankees in the bidding for free-agent outfielder Carlos Beltran. 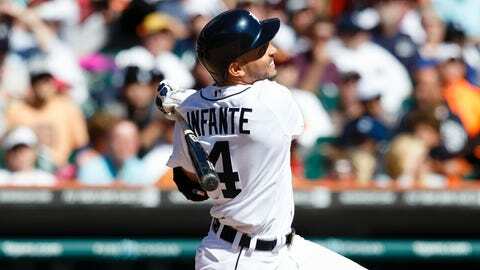 Infante, 31, had one of his best years as a major leaguer for the Tigers in 2013, hitting .318 with a .345 on-base percentage. He also hit 10 homers and drove in 51 runs. The arrival of Infante would come on the heels of the recent trade for Brewers outfielder Norichika Aoki, and give the Royals’ batting order an entirely new look at the top. Aoki projects to be the Royals’ leadoff man, and Infante likely would bat second, in front of Eric Hosmer, Billy Butler, Alex Gordon, Sal Perez, Mike Moustakas, Lorenzo Cain and Alcides Escobar. Infante is a career .279 hitter with a .319 on-base percentage. With Infante aboard, the Royals would be able to use Emilio Bonifacio in a utility role, where club officials believe he is best suited. Bonifacio can play second base, shortstop, third base and all outfield positions and is likely to see a sizable amount of playing time. Bonifacio hit .285 for the Royals with a .352 on-base percentage in 42 games.